DKE Toys will be at Designer Con 2018 this week, and they’ll be bringing with them a ton of killer kitbashed bootleg resin figures featuring unique non-licensed takes on your favorite Star Wars characters, including two fantastic releases by UK artist RYCA (aka Ryan Callanan)! 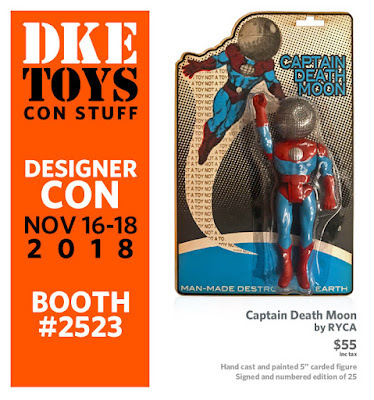 First up is the Captain Death Moon resin figure, which puts the deadly Death Star on a Captain Planet body. Each 5” figure is hand cast and hand painted, and comes packaged in a full color, signed and numbered blister card. 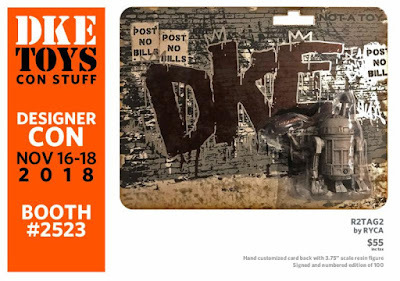 Limited to just 25 pieces, collectors can purchase this fun mash-up at the DKE Toys DCon booth #2523 for $55. RYCA’s second Star Wars inspired Designer Con 2018 exclusive is the R2TAG2 resin figure. This graffiti spraying astromech droid is a 3.75” scale resin figure, and comes packaged on a hand customized, signed and numbered card back. Limited to 100 pieces, collectors can purchase this collectible at the DKE Toys DCon booth for $55.